Location in August 1914: The 8th (King’s Royal Irish) Hussars was stationed at Ambala (Haryana, India) having arrived from Lucknow (Uttar Pradesh, India) on 18 February 1914. The Regiment arrived from England on 19 October 1909. When the First World War began in August 1914, the 8th Hussars was stationed at Ambala, India. The Regiment was mobilized on the 31 August and left India at Bombay in two halves in October 1914. The Regiment served as part of the Ambala Cavalry Brigade, 1st Indian Cavalry Division and arrived at Marseilles, France in November. By the time the 8th Hussars arrived in France, a system of trenches which we come to associate with the Western Front were firmly established. This meant that the Regiment couldn’t be used in a mounted role but often went into the trenches dismounted or provided digging parties. The 8th Hussars first experience of trench warfare was at Gorre, France on 9 December but apart from rotations in and out of the frontline, there’s not much to report for 1914-17. A good resource to use is the 8th Hussars’ war diaries which I have discussed below as they record the Regiment’s location and activities. In September 1915, the Ambala Brigade was transferred to the 2nd Indian Cavalry Division which was renamed as the 5th Cavalry Division in November 1916. The 8th Hussars did take part in the Battle of Cambrai on 30 November and 1 December 1917. In February 1918, the 5th Cavalry Division was broken up and the 8th Hussars joined the 9th Cavalry Brigade, 1st Cavalry Division. The 8th Hussars suffered heavy casualties between 22 and 31 March 1918 in consequence of the German Spring Offensive. There is a detailed description of the fighting in the Regimental history. The Regiment returned to Britain in March 1919 and was stationed at Shorncliffe. You will also want to look at the 8th Hussars’ war diaries which I have discussed below and these can be downloaded for a small fee from the National Archives. There is also a regimental history which is useful: The History of the VIII King’s Royal Irish Hussars, 1693-1927 by the Rev. Robert H. Murray. If you’re researching an officer or other rank who served in India with the Regiment, check the 1911 Delhi Durar Roll (free to download). Officers: Usually easier on average to research compared to their infantry counterparts. A service record is the most important document to find but unfortunately many have been lost. First, have a search in the National Archives’ catalogue, I offer a copying service for these files. However, if an officer served past April 1922 then the Ministry of Defence will hold their service record: Ordering a Service Record from the MOD. The regimental history records officers throughout and is indexed. You will want to search contemporary newspapers, especially Tatler, as officers were often reported on even if they hadn’t become a casualty. The war diaries have a lot of officers recorded in them and also search the London Gazette and Hart’s Army List (for pre-war officers). 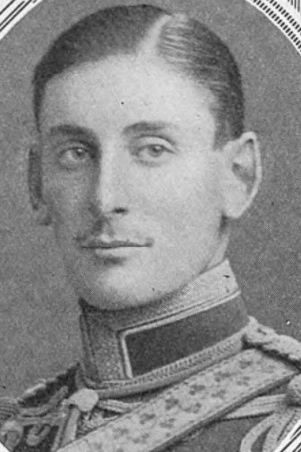 A portrait of Second Lieutenant R. L. Kennedy, 8th Hussars which was published in The Sphere after he was wounded. The Sphere is an excellent resource to search if you’re looking for an officer casualty. Other Ranks: Try to find their service record, unfortunately, many were lost in the Blitz. As long as a soldier served outside of Great Britain and Ireland there will be medal records to consult: Medal Index Card. You can often work out when a soldier joined the 8th Hussars from their regimental number. Newspapers should also be searched, especially for casualties and gallantry medal winners. The Regiment’s casualties are recorded in its war diaries, so you should check them carefully. These casualties also include those leaving the Regiment due to sickness or another reason, such as being granted a commission. The regimental number is often recorded which makes identifying casualties a lot easier as you can cross reference this number with their Medal Index Card. There must be hundreds of men recorded in the war diaries. I have transcribed the names of men who appear in August 1914 below. To research either an officer or other rank who served during the war, you’ll need to search both the records on FindmyPast and Ancestry. These sites offer free trials and if you live in Britain you can often access them at your local library. Clicking on the banner below will take you to FindmyPast. 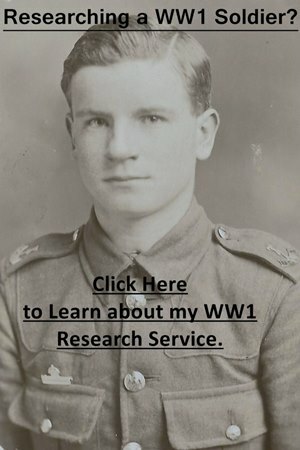 All the war diaries for the 8th (King’s Royal Irish) Hussars have been digitized and are available to download for a small fee from the National Archives’ website by clicking on the blue text below. Notes: A good war diary, though like many cavalry war diaries for the Western Front many months have short repetitive entries. Casualties, usually with a regimental number, are recorded in the war diary. Notes: A good war diary for this period. The Regiment’s casualties are recorded with regimental numbers, including the large number sustained by the 8th Hussars on the 27 March and 30 November 1917. Notes: A good war diary with detailed entries for the German Spring Offensive. Unfortunately, no casualties are recorded in this war diary. Notes: A poor war diary with brief entries which has been typed and appears after a war diary for the 5th Indian Cavalry. There is a list of British officers who left Lucknow with the Regiment on 12 October 1920. There are no appendices. There is a monumental regimental history for the Regiment: The History of the VIII King’s Royal Irish Hussars, 1693-1927 by the Rev. Robert H. Murray. This book was originally published in two volumes in 1928 but was reprinted by the Naval and Military Press in 2005. The history devotes 100 pages to the 8th Hussars’ service during the war and should be used in conjunction with the war diaries above. There is an appendix which records all the officers who served with the Regiment during the war and there is a useful index. 4 August 1914: War declared between England and Germany. 12 August 1914: No. 2033 Corporal Horace Browning proceeded to Lahore for duty with No.7 British Field Ambulance on mobilization. A Squadron: Nos. 1475 Charles C Flynn, 4043 Nicholas Whelan, 4210 George Cummins, 7529  Walter G Fisher, 6874 John Forde, 7837 Joseph Roden. B Squadron: Nos. 2325 Alexander Gray, 1283 Edward Haverty, 4221 Edwin M Page. C Squadron: Nos.6745 Harold J Bennett, 7819 George Davis, 6148 E Edwards, 432 George Hickey, 4151 John Keogh. D Squadron: Nos. 4326 Alfred Dixon, 3167 Thomas Gatercole, 982 Thomas Girvan, 5368 Richard Holgate, 4/7523 Matthew Daly. 17 August 1914: The aforementioned Privates detailed for service to Batmen to the Sirhind Brigade Staff left Ambala en route to Bombay for embarkation: Nos. 6079 Lawrence May “A”, 3359 Charles Burton “B”, 4122 William F Bourne “D”. 18 August 1914: No. 2753 Corporal Frederick Lambert “C” left Ambala for field service with the Divisional Supply Column (destination unknown). The aforementioned Privates left Ambala en route to Jullunder for service as Batmen to Headquarters 8th Infantry Brigade proceeding on field service: Nos 2226 A Cooke “B”, 6052 Bertie Watts “C”, 6394  Patrick Anderson “D” Squadron. 28 August 1914: It was officially notified that the trooping programme for one year 1914-1915 was cancelled. 30 August 1914: The Regiment received orders to mobilize for field service with the 3rd Indian Cavalry Brigade, Indian Expeditionary Force ‘A’. 31 August 1914: Mobilization commenced on this date. The Depot under the command of Captain P. S. Alexander opened on this date on the mobilization of the Regiment. The undermentioned Reservists of the Regiment residing in India were called to the Colours and rejoined the Regiment on this day were posted to “B” and “D” Squadrons respectively: No. 6363 Sergt Alfred Russell Watson. No. 6578 Corp. Joseph Riley. Medical inspection of Officers, Warrant Officers, N.C.o’s and men and veterinary inspection of horses proceeding on field service with the Indian Expeditionary Force A. No. 4738 Bandsman Harold L Burrow, reservist 3rd Hussars, rejoined the Colours on this date on mobilization and was posted to “A” Squadron.